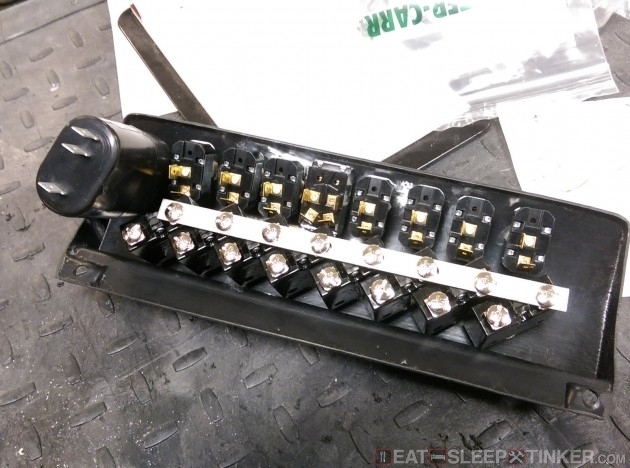 Eat, Sleep, Tinker.Spec E46 Build Part IX: Electrical - Eat, Sleep, Tinker. 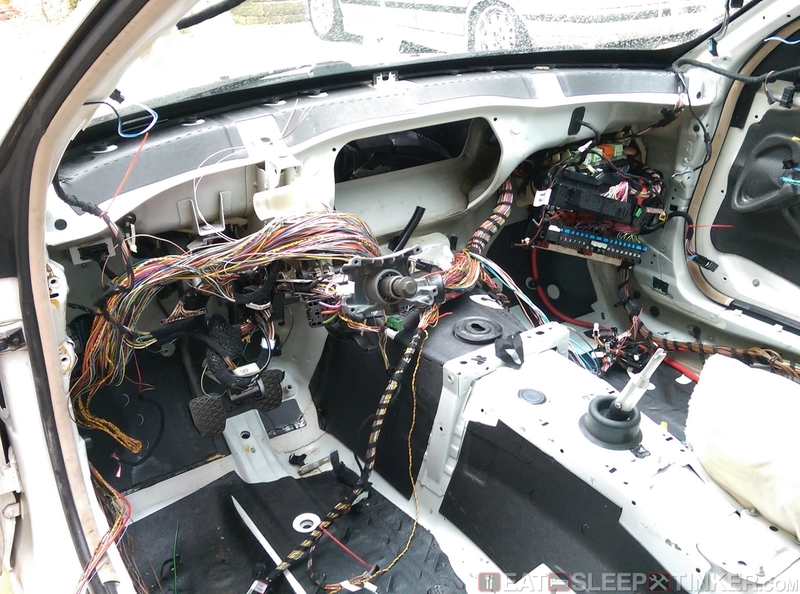 The vast majority of the stock wiring was removed from the car during deconstruction, which I covered in Part I of the build. 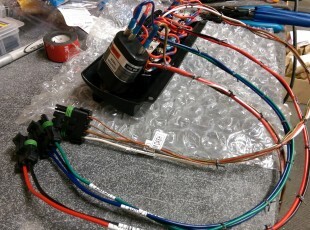 Fortunately the stereo harness was completely separate from the rest of the chassis wiring. I still had to go wire by wire for things like electric windows, seat controls, HVAC, airbags, and interior lights. I picked up a depining tool set from ECS to help remove the wires completely, all the way to the fuse box. 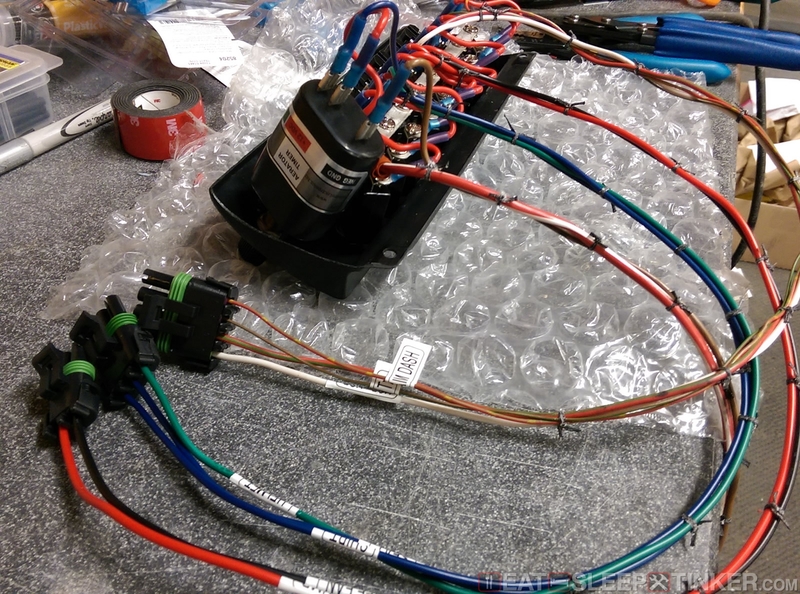 This was certainly a daunting task, but taking it one wire at a time and labeling everything helped to insure no needed wires were cut. 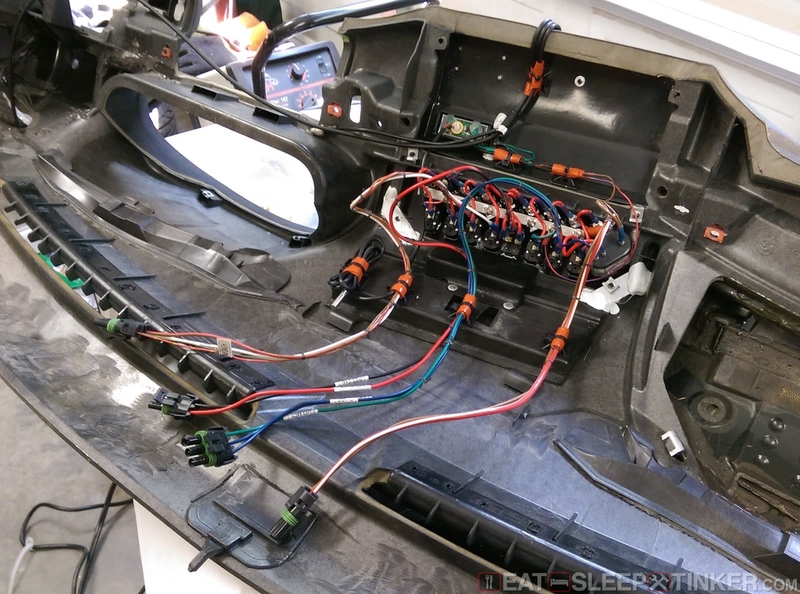 The remaining chassis harness was fairly simple, just operating the tail-lights, fuel pump, wipers, head-lights, and instrument cluster. I left the OEM chassis computer in place so that the wiper stalks to operates as normal with intermittent settings. I also left the OEM light control unit, so I can still have turn signals, high beam, and flash just like stock. 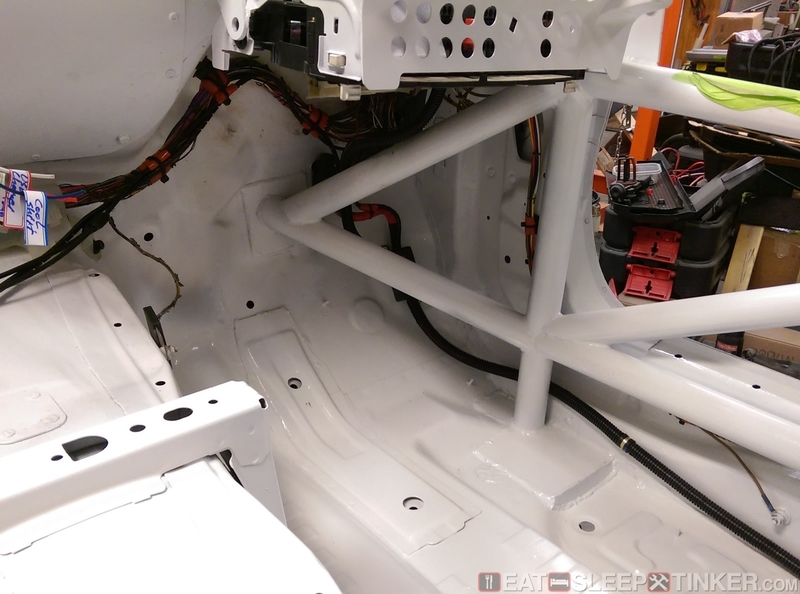 The engine bay side was fairly simple as well, just removing the emissions related equipment, HVAC control (heater valve, AC compressor wiring), horns, washer level & pump, hood switch, foglights, side markers, and washer nozzle heaters. A lot of weight can be lost here by swapping to a lightweight ATV/Motorcycle battery. 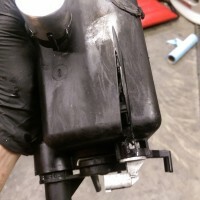 I knew my car would be a little heavy with the cooling shirt system and differential cooler at the back (not to mention a heavy driver) so I decided to lose the boat anchor stock battery. I’ve used the Deka batteries in the past and had decent results. 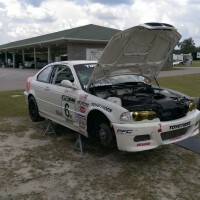 I wouldn’t recommend one for a daily driver, but they work well for a race car. These are the same batteries sold under Braille brand and other store brands, yet much less expensive. 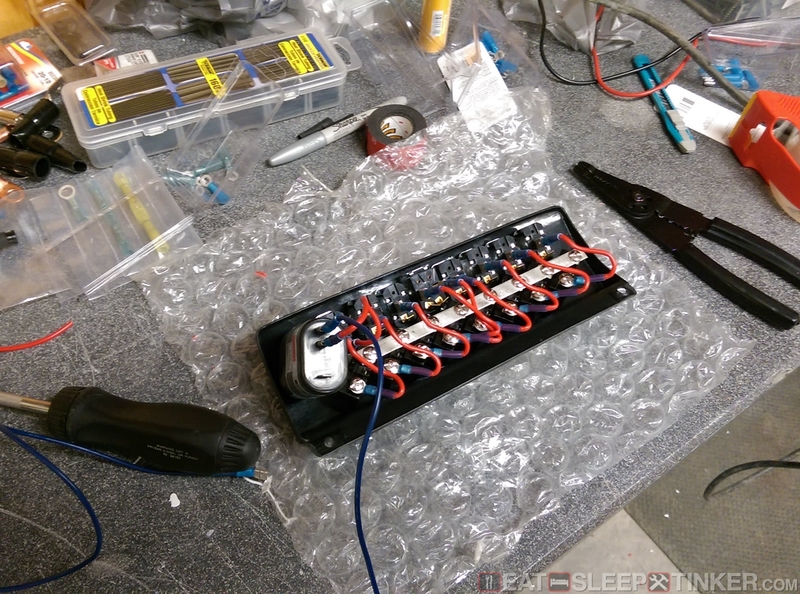 This ETX 16 battery weighs in at 16 lbs and easily cranks the M54. I made a simple battery bracket out of aluminum angle stock, which was riveted to the OE battery floor. A piece of U-channel aluminum, threaded rods, and wing nuts made for a custom hold down. 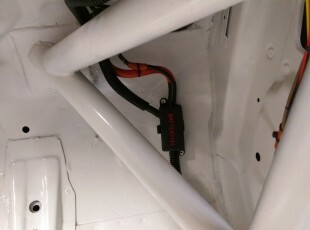 The stock grounding lug was used with some longer cable. 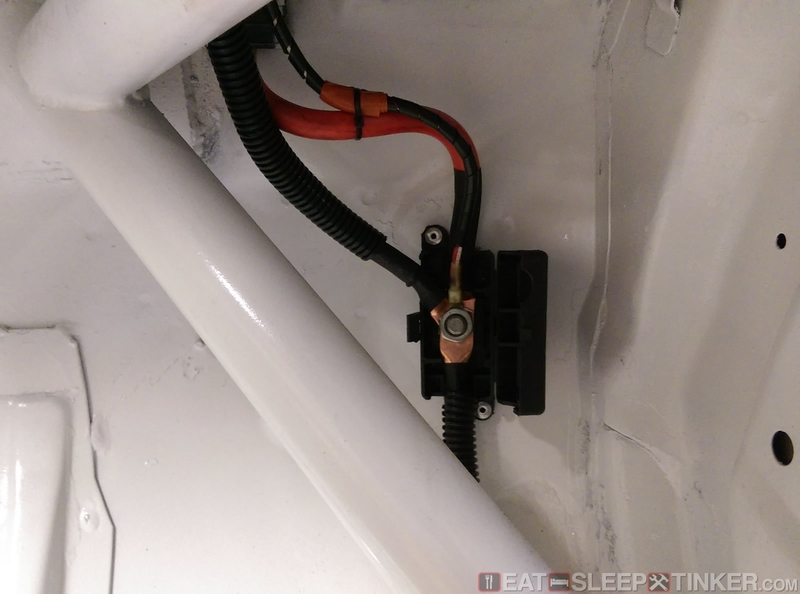 In the photo above you can see the power cable as it runs from the battery positive terminal and forward to the kill solenoid. (note: the kill solenoid should be oriented with its terminals on top, I have to fix this.) 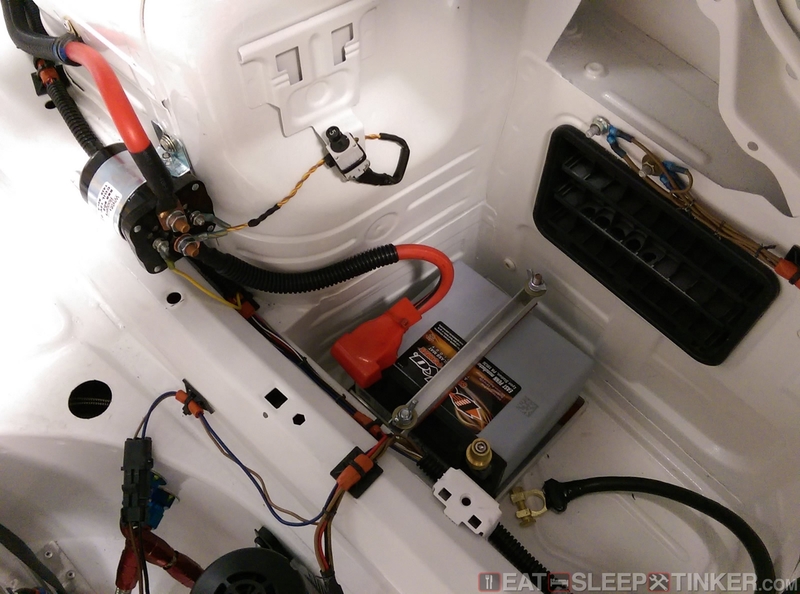 This is the electrical kill setup from BimmerWorld, which uses a heavy duty solenoid to kill power rather than a mechanical switch and pull cables. The small circuit breaker is also part of this system. Since I was pairing down the electrical system to the bare minimum, I deleted the smaller wire and ran a single wire from the battery up to the firewall. 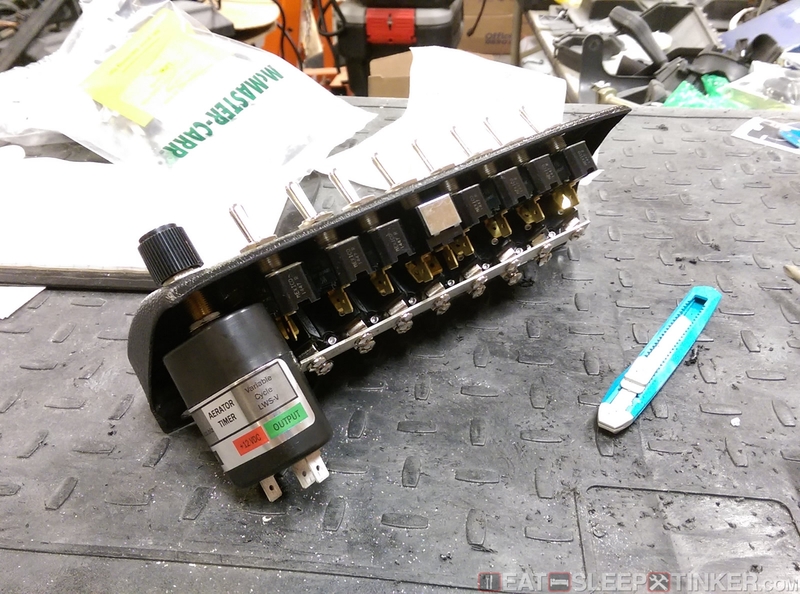 At that point it needed to be split so that power could run to the OE fuse box and continue on to the engine. 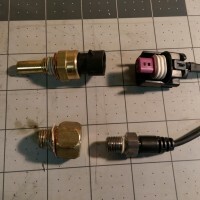 To accomplish this I used a GM/Delphi battery terminal box. I trimmed the plastic a bit to allow the cables to exit, then mounted the box behind the passenger side foot protection bars. Each of these circuits have a corresponding circuit breaker directly below the switch. Power is distributed across the supply lugs via a solid metal bus bar. From there short lengths of wire with ring terminals run to the individual switches. Switched power then runs out to Weatherpack style connectors to allow for removal/installation of the dash without much fuss.